Gingerbread Cupcakes are perfect when teamed up with lemon glace frosting. Finely chopped glace ginger sprinkled on the frosting makes these ideal for a special morning or afternoon tea. This recipe makes really tasty, moist cupcakes which keep well for several days. Sift plain and self-raising flours, bicarb soda, ginger and mixed spice into a large bowl. Add brown sugar and stir until combined. Add golden syrup, milk, olive oil and eggs in a jug and stir until combined. Add golden syrup mixture to flour mixture and stir until just combined. Bake for 15 minutes or until a skewer inserted into the middle of a gingerbread cupcake comes out clean. Leave cupcakes in trays for 5 minutes before turning onto a wire rack to cool. 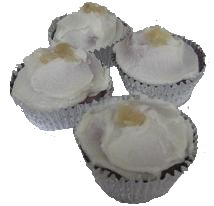 When cold top gingerbread cup cakes with lemon glace frosting and chopped glace ginger.